Sometimes when you see a series of shows what strikes you is not so much the specific intent of each, but a more generally pervasive feeling. It can be hard to discern whether or not this speaks of your own existing preoccupations more or less than the external prompt offered by an exhibition. Often neither, at least not entirely. The ‘meaning’ of a show resides somewhere in-between. Writing on the practice of London-based painter Tomma Abts, Jan Verwoert drew attention to Abts’s ability to imbue her paintings with a corporeal presence at odds with their apparently analytical formal construction. Although they remain just out of reach, looking at these works is to understand that real things here are mirrored, distorted. In returning from a collaboration with the unknown, Abts’s work is located within a specific lineage. As noted by Paul Klee, art like hers engages a visual language ‘abstract with memories’. Over the last month in Melbourne it seemed that practices that unwound the mystery at the heart of projects like Abts’s were everywhere I turned. In contrast to the ahistorical quality of the German artist’s work, many of these strike me as existing within a more definite art historical trajectory. 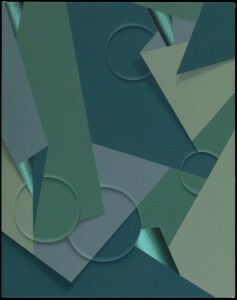 This art’s tendency to reframe the lofty aims of abstraction by locating them in the everyday was made possible by certain conditions of art after modernism. In his essay on Abts, Verwoert goes on to note that ‘abstraction is the opposite of information’, which I take to mean that in an information-rich world, abstraction goes against the tide of instant recognition. Kind of like the art world equivalent of the slow food movement. It would seem then that locating abstraction as a readymade is a different project entirely. Undoubtedly this strategy is often smart and seductive, but it also implicates the viewer in a different way—in a sometimes frustrating double bind, you can’t help but get the joke (or the trick, or the process) whether you like it or not. By contrast, Abts’s paintings present us with a ‘dumbness’ in that their language provides imperfect means to render unknowable things—even their titles are imperfect approximations of ‘real’ language. Unlike much work on display in Melbourne recently, the fact that the viewer doesn’t ‘get it’ is exactly their point. 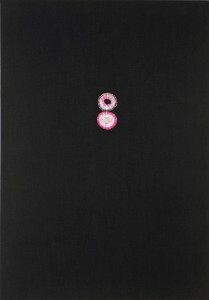 Elizabeth Pulie, Mixed historical, Neon Parc, Melbourne, 6–30 June 2012. Peter Atkins, The monopoly project, Tolarno Galleries, Melbourne, 2–30 June 2012. 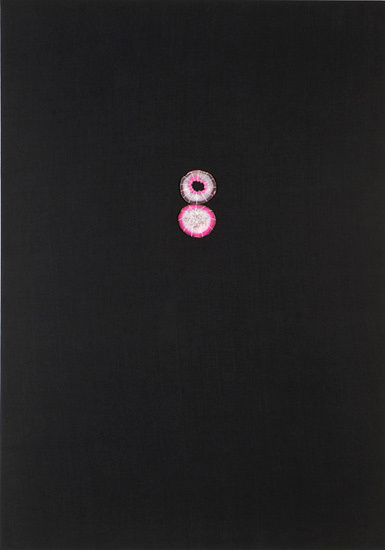 Alasdair McLuckie, Pink lions, Murray White Room, Melbourne, 27 April – 9 June 2012. John Nixon, EPW: colour-music, Gertrude Contemporary, Melbourne, 1–30 June 2012.